Modena was a very peculiar case. I recall him being ridiculously superstitious. Gloves inside out, having to use a certain side of the garage, not sleeping in a hotel room with his feet facing the door?! I'm sure there were more. Didn't he retire from his first race because he was tired? He was undoubtedly talented. 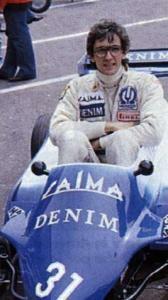 I think his first test was for Benetton and he was immediately on the pace, and Monaco seemed to suit him. Yeah his first race in a Brabham at Adelaide in '87. Don't think he was physically fit enough for a Grand Prix especially one at Adelaide which although not a hard circuit to learn is very hard physically due to the slippery nature of the road surface and the amount of work you would have to do to keep the car on the racing line, very hard to do even for the more experienced drivers as we see probably more spins and cars going off the track that weekend than throughout the entire season. Modena had been off a couple of times and had fallen to the back, regarding that he was only used to the race distance in a F3000 car it was probably wise he did as likely he would have ended up hitting the wall at some point. Even his team mate de Cesaris had been flying off the road on numerous occasions as he tended to do in any car, but even so..... I do think though his team would have been aware of his lack of fitness so maybe they weren't to bothered otherwise they would have taken someone like Martin Brundle who probably would have been delighted to move away from Zakspeed to a more competitive car. Those big turbos were a handful and especially that S4 BMW powered Brabham was a beast to control, you had to be very fit to go a race distance in one of these. 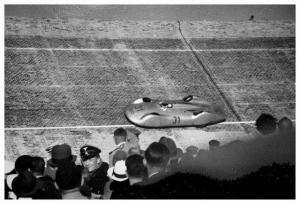 I don't think a lot of drivers back then took their fitness as seriously like they do today. Something I find strange its about how American drivers seem to be either what they would call road course or speedway racers very few very good at both. Plenty of European and Brazilians go over there and are successful at both especially in single seater racing such as Indycar or Champ car and Indy Racing League as they were called before the remerge. A good example is Sam Hornish Jr, brilliant IRL and Indycar driver absolutely fearless and highly successful on the speedways but left the series for Nascar once the Indycar series started to included road courses, maybe his reason might have nothing to do with this but there had been a gradual large movement from the series (IRL) of American drivers during the early 00s. I think it's more to do with what they are used to racing on, most of the drivers in America have drove ovals from the start of their careers, drivers from other countries tend to start on circuits. Going from circuit to oval racing in theory should be easier than going from oval to circuit racing. I know that's really over simplifying things but that's probably the main reason why American drivers are one or the other. The Bathurst 12 hours is on next Saturday at 8pm, I'm really looking forward to it. Bathurst is a phenomenal track. I see Motors TV has the Le Touquet beach race on live from 1145 next Sunday. I'm not a great follower of motocross/enduro racing, but the start is always worth watching. Keke Rosberg and Patrick Depailler immediately spring to mind, happily puffing away pre-race. I believe the first driver to take a personal physician/dietician to races with them was actually the very unfortunate Riccardo Paletti. When I've got time later I'll try and find where I read that. A lot of those Brabhams are locked away in Bernie's private industrial unit somewhere near the M25. I have details of the cars he's got which I'll post if I can find them. I got them from the guy who used to look after them. I know he has at least one lowline BT55. Shame he doesn't let any of us plebs in to see them. Last time I heard Bernie's collection was split between Biggin Hill and Switzerland. It is HUGE. Some of Bernie's cars (the numbers in brackets are chassis numbers). This list is a few years old so things may have changed. I know he sold off some sports cars, not sure about the F1 stuff. I've read that during the early eighties almost two thirds of the grids were smokers but only a few openly smoked around the race track. Pretty sure most of the French drivers were smokers and Manfred Winklehock, Chico Serra (there's a story about him nearly causing a pit fire back in F3) among them. I read an article about Paletti not long ago, I'm sure I've got it somewhere and will scan and put it up here when I find it, its probably from Autosport or F1 Magazine. I think I read the same article, in which case it would either have been in F1 Racing or Motor Sport. There's also a bit about Paletti in Christopher Hilton's book about the 1982 season. I have it but can't lay my hands on it just now. I believe he was good friends with Eliseo Salazar. What happened in Montreal was just dreadful. Pironi being involved (and helping in the rescue) so soon after Zolder, and Paletti's mother witnessing the whole thing from the pit lane. I'm sure there was a sequence of photos taken which were widely reproduced at the time by a supermodel who was also in the pit lane (can't remember her name). The cameraman who got really up close while they were trying to save Paletti (and probably in the way) was the guy who published a series of crash compilation videos. Think he eventually died in a plane crash ironically. Brian somebody. Think it was Brian Kreisky or Kriesky. The supermodel was Christie Brinkley. A few images covering half a century. Bernd Rosemeyer at speed on the AVUS banking in 1937 driving an Auto Union streamliner. Everyone seems engrossed apart from the young man in Nazi uniform. 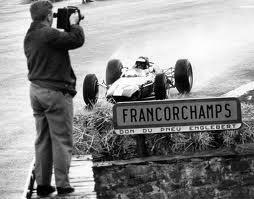 Jim Clark (Lotus-Climax) approaching the bridge over Eau Rouge just a few feet from a photographer. Another Fifer. 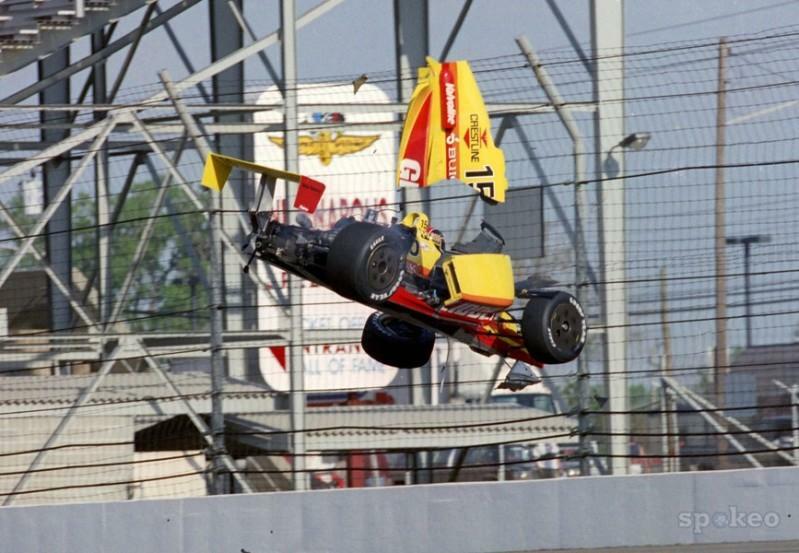 This time it's Jim Crawford at Indy in 1990 catching some serious air. He was uninjured. Good pic mate, that's the incident I referred to earlier, the local servicemen presented him with an award for that spill! Yes, he was presented his Wings of Gold by the US Navy (some helicopter division). He came out with quite a funny quote about having to adjust the ride height of his car as well, but I don't have it to hand. Actually hoping to get some work done on the biography tonight. Incidentally, the year before (1989) he walked away from another huge crash at Indy that damaged his car so badly the Lola mechanics back in England said it was the worst they'd ever seen. Despite this they worked flat out round the clock and repaired it, which perhaps says a lot about the affection they had for Jim (he'd qualified fourth but had to start the race with the same chassis to keep his position). Tonight, ITV4 at 8.30pm. First in an eight part series following the Honda TT Legends team. I was bored earlier and made a wee video about Jim. My first Youtube effort so don't expect anything spectacular. Motors TV had some last year. I watched the Skerries and another one (Dundrod? ).